Elfering, Achim, Prof. Dr., Associate professor at University of Bern, (Switzerland), Institute of Psychology, Department of Work and Organizational Psychology, and National Centre of Competence in Research, Affective Sciences, University of Geneva, CISA, Geneva. Interest and work on occupational health and ocupational safety. Repetitive movement and a lack of postural change are known risk factors for musculoskeletal pain in cashiers. This study tests emotional dissonance – the demand to keep being polite to impolite customers – as an additional risk factor. Furthermore, sleep problems are expected to mediate the link between emotion work and musculoskeletal pain. Data contains 103 female supermarket cashiers from three supermarkets of a large retailer responded to a questionnaire (participation rate 60.6%). An open question asked for the most negative job facets in daily work. Standardized questionnaire were used to assess emotional dissonance, sleep problems and musculoskeletal pain. Responses to the open question showed experience of unkind customers as the most prevalent negative experience at work reported by 47.6% of cashiers, followed by prolonged sitting (8.7%). Emotional dissonance was a significant predictor of neck and back pain when BMI, age, part-time work, and change of hand function during their shift (work rotation) were controlled (β = .30, p < .01). Moreover, sleep problems were confirmed as a mediator with respect to neck and back pain (B = .21, SE = .10, CI = 02–.22). No mediation was found in prediction of pain in arms and shoulders or hips, legs, and feet. Emotional dissonance in work of cashiers appeared as a unique risk factor of neck and back pain. Work design should pay more attention to the social demands of cashier work. Work of supermarket cashiers has been explored for several occupational risk factors including magnetic field exposure from the cash register and scanning system (Forssen et al., 2004), exposure to chemicals like Bisphenol A from the handling of receipts (Lu et al., 2013), and the risk of developing a nickel allergy by handling of coins (Gawkrodger, McLeod and Dobson, 2012; Thyssen et al., 2013). A higher risk of bladder cancer is hypothesized to result from lifestyle and fewer opportunities for micturition, prolonging the contact time between the bladder mucosa and any urinary carcinogens that might be present (Colt et al., 2004). However, the majority of research on the occupational health of cashiers has addressed musculoskeletal pain, especially complaints about pain in the upper extremities, shoulders, and back that are supposed to result from biomechanical load from repetitive work (Bonfiglioli et al., 2007; Peppoloni et al., 2016; Sansone et al., 2014; Sansone et al., 2015). Among occupational health problems, musculoskeletal pain in arms, shoulders, knees, legs, and especially in the back is common among workers in many occupations. Specifically, compared to other occupations, reports of musculoskeletal pain are more frequent in cashiers: For instance, in Italian female cashiers musculoskeletal pain in arms and shoulders was recently reported in 46.5% of cashiers but only in 25.5% of a female control group (Sansone et al., 2014). The Global Burden of Disease Study 2013 reported low back pain as the cause of years lived with disability (and neck pain on position four; Vos et al., 2015). The cost of low back pain associated with presenteeism, absenteeism, and work disablement is high: In Switzerland, musculoskeletal pain is a major health problem causing costs of 1.3–3.2% of the gross domestic product (SNF, 2009). Lower back pain is responsible for about 6.1% of the total health care expenditure in Switzerland (Wieser et al. 2011). Not to mention the individual burden on the person itself, including stress at work, family stress and economic stress, which all result in a reduced quality of life (Elfering and Mannion, 2008). Hence, prevention of work-related musculoskeletal pain is a top priority (Elfering, 2006). Beside repetitive movements, prolonged sitting or standing of cashiers was studied as a risk factor. For instance, in a laboratory experiment with ten cashiers from Dutch retailer environment Lehman, Psihogios and Meulenbroek (2001) found lower muscle activity in the neck and shoulders when standing and using a bi-optic scanner. Yet, sitting is usual for cashiers in Europe (Hinnen et al., 1992) while prolonged standing of cashiers is typical in North America, Asia and Australia (Messing et al., 2005). Frequent short breaks and work rotation between different tasks or at least between cashier desks that allow a change of left/right arm and shoulder function were proven to reduce the risk from repetitive work (Asensio-Cuesta et al., 2012; Rissén et al., 2002). However, Bernard (2005) showed that what characterizes cashiers’ work is not only repetitive manual work but having to manage flows of products and customers. Bernard therefore characterizes cashiers’ worktime often as a compromise that comes out of balancing productivity with human relations – and sometimes the compromise causes conflict (Bernard, 2005). Studies by Lundberg and colleagues show that mental stress and physical effort increase electromyographic activity and musculoskeletal pain (cf., Lundberg et al., 1999). An important step in understanding the link between work demands of cashiers and musculoskeletal pain is to look at work strain as a mediating mechanism. The purpose of the present study is to link emotion work and musculoskeletal pain in cashiers via sleep problems. In a qualitative study on supermarket cashiers in Israel it became clear that customers and cashiers interact frequently while having complex interaction strategies, and interactions are often stressful (Rafaeli, 1989). In this pioneering study from Israel there was no management rule that addressed interactions between cashiers and customers. Nowadays, in most countries of the Western World management rules about customer interactions oblige cashiers to be friendly – even with impolite customers (Ford, 1995; Grandey, Rupp and Brice, 2015). Such management rules increase the need of emotion work and the experience of emotional dissonance. In face-to-face interactions with costumers displaying required emotions become a part of the job leading to the concept of emotion work. Emotion work (or emotional labour) “should be defined as the psychological processes necessary to regulate organizationally desired emotions” (Zapf, 2002, p. 239). It often has positive effects on well-being, both on the customer side and the employee side (Hülsheger and Schewe, 2011; Zimmermann, Dormann and Dollard, 2011). However, emotion work can instead have negative effects on employees’ well-being, often because of a misfit between emotions showed and emotions felt (Zapf, 2002). Having to show positive emotions that do not fit their felt emotions often results in emotional dissonance (Zapf et al., 2001). Suppression of negative emotions often allows them to persist and increases regulatory effort and may promote a feeling of lack of authenticity (Semmer, Meier and Beehr, 2016). Emotion work is a central demand in supermarket cashiers’ work (Vignon and Scoyez, 2011; Rafaeli, 1989). Among other demands of emotion work in cashiers, such as the requirement to be sensitive to clients’ emotions, emotional dissonance was found to be a strong stressor in cashiers (Zapf, 2002). In self-reports of cashiers, impolite behaviour of customers appears to be the leading source of stress, followed by stress that arises from bad design or function of the computer system or other technical equipment (Kihlstedt and Hägg, 2011). Up to now, emotional dissonance in cashiers was explored as a risk of well-being, but musculoskeletal pain as outcome was not in focus before (Elfering, 2006). Work strain depicts a physiological, behavioural, and psychological reaction to work demands, threats, and challenges (i.e., stressors such as emotional dissonance) and implies feeling stressed and exhausted (Ganster and Rosen, 2013). Work strain, in turn, corresponds to musculoskeletal pain via mechanisms that elicit muscle tension and induce pain; these are both physical (e.g., stress-induced increase in noradrenalin; Elfering et al., 2008; Elfering et al., 2002; Melin and Lundberg, 1997) and mental (e.g., pain-related beliefs; Elfering et al., 2015). According to the ‘Cinderella Hypothesis’ (referring to Cinderella, who was first to rise and start work and last to end work and rest; Hägg, 1991), the small, low-threshold motor units are always recruited first, before large ones, and they remain activated until the complete relaxation of the muscle. These low-threshold motor units are part of a strain response to stressors, and strain-related increase of noradrenalin probably augments the sensitivity of low-threshold motor units (Melin and Lundberg, 1997; Lundberg and Melin, 2002). Thus, work strain prolongs tension and sensitivity leading to musculoskeletal pain. Disturbed sleep, as a psychosomatic strain response (see Ganster and Rosen, 2013), might also influence the perception of work. Recently, Reddy and colleagues (2016) found just one night of modest sleep loss to be related to large adverse effects on positive affect and anxiety and, to a lesser extent, negative affect. Impaired sleep was found to interfere with psycho-physiological functions enabling self-control (Motomura et al., 2013). Drawing on the Ego Depletion model, Barnes, Schaubroeck, Huth and Ghumman (2011), within both laboratory and field study settings, found disturbed sleep to be associated with unethical (i.e., morally unacceptable) behaviour due to depleted self-control resources. Similar to ethical behaviour, emotional dissonance – perceived discrepancy between felt emotions and those the employee’s organization requires them to display – demands self-control resources (Diestel, Rivkin and Schmidt, 2015; Zapf and Holz, 2006). In consequence, cashiers with impaired sleep might much more easily be disturbed by an unpleasant situation (Chuah et al., 2010), and even weak emotional stressors might trigger mood deterioration (Minkel et al., 2012) that might lead to emotional dissonance. However, within the scope of stress research, adverse working conditions and their affective consequences might also be associated with disturbed sleep (for a review see Sonnentag, Casper and Pinck, 2016). Evidence shows that strain may arise from the experience of emotional dissonance (Diestel, Rivkin and Schmidt, 2015; Grandey and Gabriel, 2015; Grandey, Rupp and Brice, 2015; Zapf, 2002). Moreover, there is also evidence that strain is related to musculoskeletal pain and the mechanism, i.e., as described by the Cinderella model, can sufficiently explain the link between work strain and musculoskeletal pain in cashiers (Lundberg and Melin, 2002). As emotional dissonance depletes regulatory resources (Zapf and Holz, 2006), these resources have to be restored. Sleep restores limited regulatory resources facilitating self-control functioning (Barber et al., 2010; Diestel, Rivkin and Schmidt, 2015). On the other hand, sleep regulation seems to be impaired by stressors. The type of dysregulation – such as awakenings (Pereira and Elfering, 2014a) and change of sleep phases – seems to depend on stressor characteristics: Unpredictable and uncontrollable stressors – such as encounters with aggressive customer behaviour – seem to cause the most severe dysregulation (Sanford, Suchecki and Meerlo, 2015; Sonnentag, et al., 2016). A recent systematic review on work stressors that arise from social interaction and sleep found 14 studies (Pereira et al., 2016), 10 of which reported correlations. The weighted mean correlation of these 10 studies was Rho = .21 (CI95 = .12–.31). In addition, a recent longitudinal large-scale study on older adults confirmed that strain mediates the link between weight discrimination experiences and impaired sleep (Vaghela and Sutin, 2016). In sum, sleep is a special form of recovery that restores stress-drained resources and is at the same time impaired by stress (Åkerstedt, Nilsson and Kecklund, 2009). The neurotransmitters and hormones involved in the stress response are also involved in sleep regulation, and “the interaction between stress and sleep is implicated in a variety of disease processes and psychiatric disorders” (Sanford, Suchecki and Meerlo, 2015: 381). Another recent – however, cross-sectional – large-scale study supported a mediation model in which strain and restricted sleep quality mediated the association between unfairness at work and health complaints (Elfering et al., 2016). Yet, there is evidence that being nagged by pain might lead to impaired sleep as well as some evidence that impaired sleep was adversely associated with pain (Kelly et al., 2011; Lautenbacher, Kundermann and Krieg, 2006). A possible mechanism by which disturbed sleep can cause pain is by enhancing pain sensitivity (Lautenbacher, Kundermann and Krieg, 2006). Disturbed sleep as well as sleep deprivation can decrease pain threshold and were found to produce somatic symptoms (Haack and Mullington, 2005; Lentz et al., 1999; Onen et al., 2001). Recently, based on a large eight-year, longitudinal cohort study with healthy working adults, Agmon and Armon (2014) found evidence that sleep problems precede the onset of musculoskeletal problems. Moreover, Finan, Goodin and Smith (2013) examines the recent prospective and experimental research (beginning from 2005). According to this review, longitudinal studies suggest sleep impairments to be a more reliable predictor of pain than vice versa and experimental studies found sleep disturbance to interfere with key processes of the development and maintenance of chronic pain. All in all, we expect impolite customer behaviour to be a major stressor in cashiers. Moreover, we hypothesize that emotional dissonance will be positively related to musculoskeletal pain even when other work stressors like the amount of repetitive work movements and prolonged sitting are controlled in analyses (H1). In addition, more intense and frequent emotional dissonance is expected to relate to more prevalent sleep problems, and sleep problems should be positively related to musculoskeletal problems. Hence, sleep problems are suggested to partially mediate the link between emotional dissonance and musculoskeletal pain in cashiers (H2, see Figure 1). Cashiers from three larger supermarkets were invited to participate. Cashiers received a 10 CHF voucher for participation. Out of 180 questionnaires that were distributed, 109 cashiers responded (participation rate 60.6%). Four questionnaires were filled out incompletely with one or more pages of the questionnaire not filled out. These four participants were excluded from the sample. The remaining 105 cashiers consisted of 103 women and 2 men. The two men were excluded from analysis to avoid bias from unbalanced gender distribution in the sample. Mean age was 41.2 years (SD = 13.7). Only 14.6% of the sample worked full-time, which comprises 42h work per week (Mean percentage of the 42h stint was 50.1%, i.e. a 21h work week). Twenty-two cashiers reported having finished obligatory school as their highest level of education (21.6%). The majority of the sample (61.8%) had completed an apprenticeship including a certificate of higher vocational education and training; 12.7% stated that they had a university-entrance diploma or a degree from a college of education and 3.9% reported having a university degree. Sitting position during a shift was usual (78.6%), while standing was typical for four cashiers (3.9%) and both, sitting and standing while working the cash register was reported by 18 cashiers (17.5%). Mean tenure at the current position was 8.7 years. As the study was conducted in the German-speaking part of Switzerland, all questions were in German. The questionnaire was delivered in paper format in a closed envelope together with a postal envelope for return. The study was conducted in accordance with the requirements for participants as defined by the Swiss Society of Psychology (that is, in accordance with the Declaration of Helsinki) and approved by the local University ethics committee (2014-4-846185). Study participants were provided with information about their rights and were guaranteed anonymity. To clarify the salience of potentially stressful situations at work an open question was asked “What do you dislike at your cashier job?”. Cashiers had three lines of space to make notes. Emotional dissonance at work was assessed with an item from the Frankfurt Emotion Work Scales (FEWS); Version 3.0 (Zapf et al., 1999). The “emotional dissonance” item addressed the necessity to display emotions that are not genuinely felt. Response options ranged from “very rarely/never” (1) to “very often/constantly” (5). Sleep problems were assessed with a single question from the brief Sleep Standard Evaluation Questionnaire (Aghayev et al., 2010). The question was “How was the quality of your sleep in the last four weeks” with the response options “I had no sleep problems at all” (1) to “I had severe sleep problems” (5). Musculoskeletal pain was assessed with five items (Müller et al., 2008). The items were: “How much pain have you experienced in the following body regions today?” Pain in arms or shoulder (2 items), neck and back pain (1 item), and pain in hip, knee or feet (2). The response format was a five-point Likert scale with no pain (1) to very strong pain (5). Beside emotional dissonance other physical and mental work demands may relate to sleep and musculoskeletal pain. Therefore change of hand function as an indicator of physical load and information processing demand as indicator of mental demands were added as control variables. In all analyses, percent employment, lack of change of hand function during cashing across a work day (0 = change of hand function, 1 = no change of hand function), BMI and age were included as control variables. With respect to task stressors a single item on information processing demand (“The job requires me to keep track of more than one thing at a time.”) from the Work Design Questionnaire (WDQ, Morgeson and Humphrey, 2006; German version: Stegmann et al., 2010) was included as control variable. The mediation hypothesis was tested using Hayes’ (2013) bootstrap test for estimation of indirect effects (PROCESS macro for SPSS). The number of bootstrapped resamples was 5000. All analyses were conducted using SPSS 22.0. 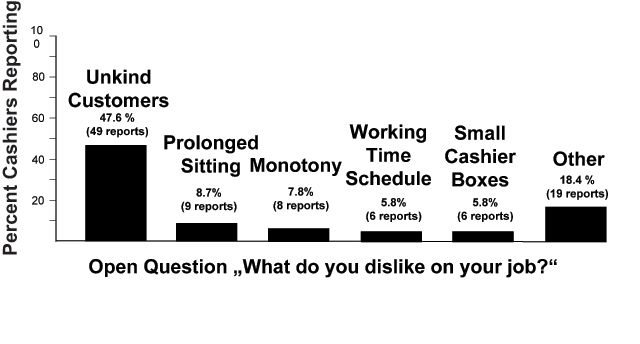 Responses to the open question of what cashiers did not like at their job included as most prevalent stressor dealing with impolite customers (reported by 47.6% of cashiers, Figure 2). Prolonged sitting was reported by 8.7%, followed by monotony (7.8%), working time schedule (5.8%), and small cashier boxes (5.8%). Means, standard deviations, estimates of reliability, and zero-order correlations among all study variables are shown in Table 1. More frequent emotional dissonance corresponded to more sleep problems and pain in the neck and back. Sleep problems were significantly related with all indicators of pain. Musculoskeletal pain in arms and shoulders, neck and pain, and pain in the hip, knees and feet were significantly interrelated (r (103) between .36 and .54, p < .001). Pain in arms and shoulders was positively related to age. Pain in hips, knees, and feet corresponded to higher BMI. Higher percent of employment was linked to more neck and back pain. Response to the open question about what supermarket cashier dislike on their job. Multiple answers were possible (N = 103). Descriptive Statistics and Zero-order Correlations between Study Variables. 1. Emotional dissonance 1 1–5 2.25 1.24 n.a. Note. N = 102. The range refers to the response options, with higher values indicating high levels of the respective variable. a No change of hand function during cashing (0 = change of hand function, 1 = no change of hand function). N.a. = not appropriate. * p < .05. ** p < .01. *** p < .001, two-tailed. In accordance with zero-order correlations, emotional dissonance and pain in arms and shoulders as well as in the hip, knees, and feet were not significantly correlated. Emotional dissonance was a significant predictor of neck and back pain (Figure 3). 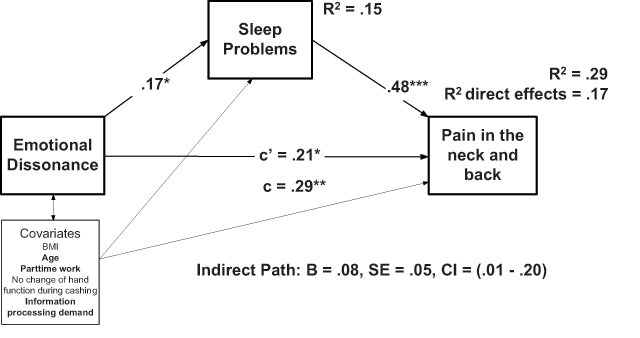 A model of partial mediation fitted the regression of pain in the neck and back on sleep problems and emotional dissonance (B = .21, SE = .10, CI = .02–.22) and the indirect path explained 13% of variation in neck and back pain. Mediation model in predicting current pain in the neck and back. Bold covariates significantly predict pain in the neck and back. Unstandardized regression coefficients (B) are estimated by use of PROCESS with 5000 bootstrap samples for bias corrected estimation of the confidence interval of indirect effect (Hayes, 2013). c = unstandardized regression coefficients (B) in prediction of pain in neck and back when the mediator sleep problems is not included in the regression model. c’ = unstandardized regression coefficients (B) in prediction of pain in neck and back when the mediator sleep problems is included in the regression model. SE = Standard error of estimation, CI = 95% confidence interval, R2 = explained variance, * p < .05. ** p < .01. *** p < .001, two-tailed. In the current study, experience of dealing with impolite customer behaviour (reported by 47.6% of cashiers) was a common disliked task referring to this as a salient stressful situation. The rate corresponds well with data from Kihlstedt and Hägg (2011) who found 22 out of 50 cashiers reported interactions with unpleasant, and stressed customer to be stressful. When confronted with impolite customer behaviour cashiers are likely to experience emotional dissonance – they keep showing a positive or neutral emotion towards the customer when they often feel a negative one. According to the current study, emotional dissonance might be a unique risk factor for neck and back pain and it seems that the risk from emotional dissonance is not limited to the mere experience of this unpleasant customer situation, but has a potential impact on sleep after work is done. In line with other studies, negative social interactions and social relations were found to be related to sleep quality (Elfering et al., 2016; Pereira et al., 2016; Pereira, Meier and Elfering, 2013). The association of sleep problems and musculoskeletal pain was confirmed before in large epidemiologic studies (Aghayev et al., 2010); specifically with respect to back pain (Kardouni, Shing and Rhon, 2016; Shmagel, Foley and Ibrahim, 2016). Thereby, sleep problems may arise as a consequence of musculoskeletal pain (Aghayev et al., 2010), as pain is known to disturb sleep by inducing arousal and triggering the physiological stress reaction (Lautenbacher, Kundermann and Krieg, 2006). On the other hand, these problems may antecede the onset of musculoskeletal pain (Agmon and Armon, 2014), as disturbed sleep enhances pain sensitivity (Lautenbacher, Kundermann and Krieg, 2006). We started from the assumption that sleep problems anteceded musculoskeletal pain. Thus, the mechanism linking work-related stress and pain is likely to be a lack of sleep-related recovery (Pereira et al., 2016). Negative social experiences at work often cause a “failure to switch off” when away from one’s work (Berset et al., 2011; Sonnentag and Bayer, 2005). Sustained negative psychophysiological arousal potentially impacts sleep quality (Pereira et al., 2016; Sonnentag, et al., 2016) and should be studied in future research on emotion work and musculoskeletal pain in cashiers. According to Geurts and Sonnentag (2006), incomplete recovery is the key process involved with impaired sleep quality as the most important recovery process. Having to follow emotional display rules and experiencing emotional dissonance can be characterized as organizational unfairness (Grandey, Rupp and Brice, 2015). Evidence for the negative association of unfairness with employee health has been confirmed (Robbins, Ford and Tetrick, 2012). In a study conducted by Elovainio et al. (2003), much of the effect of unfairness on health was attributable to sleeping problems. Hietapakka et al. (2013) found psychological distress in nurses, and found that job involvement mediated the association between organizational justice and sleep, while sleeping problems partly mediated the association between organizational justice and performance. In a cross-sectional large-scale study, Elfering et al. (2016) showed that sleep problems mediated the association between unfairness at work and unfairness in private life (and the joint unfairness experienced in both life domains) with health problems. Yet, longitudinal research recently showed full mediation of the stressor-strain link by perseverative thoughts and a bidirectional stressor-strain relation, i.e., impaired sleep quality predicts increase in work stressors (Pereira et al., 2016; Van Laethem et al., 2015). In other words, the perception of today’s working experiences and behaviour might be influenced by last night’s sleep quality. Barnes and colleagues (2011) found disturbed sleep to be associated with unethical (i.e., morally unacceptable) behaviour due to depleted self-control resources. Sleep is closely linked to emotion regulation (Reddy et al., 2016), and thus disturbed sleep affects reactions to emotional situations (Chuah et al., 2010; Minkel et al., 2012). It interferes with psycho-physiological functions enabling self-control (Barnes et al., 2011; Motomura et al., 2013). Emotional dissonance, however, demands self-control resources (Diestel, Rivkin and Schmidt, 2015; Zapf and Holz, 2006). Thus, disturbed sleep might also lead to the perception of emotional dissonance that might lead to pain. Along with our results, there is a link between emotional dissonance, disturbed sleep, and neck and back pain, yet the direction needs further investigation. There might be an ongoing cycle starting with either work stress, sleep problems or pain maintaining or even augmenting each other (e.g., Kelly et al., 2011; Lautenbacher, Kundermann and Krieg, 2006). For instance, Diestel and colleagues (2015) found that impaired sleep quality of the previous night enhanced the adverse effect of emotional dissonance on daily well-being. Evidence for reversed causation, i.e. sleep problems increase social stressors, is growing, as shown in the systematic review of Perreira et al. (2016). A recent longitudinal study clearly showed simultaneous presence of both the hypothesized stressor-sleep-strain direction and simultaneously a reversed influence of sleep on future psychosocial work stressors. In addition, there is evidence that pain also could impair sleep (Kelly et al., 2011; Smith and Haythornthwaite, 2004). For instance, pain during the night could affect sleep quality (e.g., Affleck et al., 1996) and might initiate the cycle too. Thus, a negative downward spiral is a likely risk in cashiers (Törnroos et al., 2017). Future research on a downward spiral is needed. Prevention efforts so far addressed ergonomic features of the cashier and scanning environment including job rotation (Rissén et al., 2002). According to our results, one potential means of intervention is that emotional dissonance may be reduced when cashiers learn how to improve their deep acting capability when faced with emotional demands, i.e., cashiers learn to change the felt emotion by re-appraising the situation (Hülsheger and Schewe, 2011; Semmer, Meier and Beehr, 2016; Zapf and Holz, 2006). Such a deep acting strategy seems to have more positive effects when service agents view their demands in customer conflict handling as a challenging and important task (Huang et al., 2015) that currently cannot be done with comparable quality by automated systems (Albu, 2016; Ba and Alis, 2016). Indeed, customer conflict handling, including cashiers’ behaviour directed at deterring potential conflict, expertly addressing manifest conflict, and using constructive strategies for conflict management can be characterized as a challenging task (Ndubisi, Malhotra and Wah, 2008). Thereby, emotional display rules can be a barrier for performance in customer conflict handling (Grandey, Rupp and Brice, 2015). Emotional display rules should be changed to enable more authentic cashier behaviour and reduce emotional dissonance, because the demand to handle aggressive customers seems to increase (Nienhaus et al., 2016) and negative spirals in employee-customer interactions become more likely in stressed cashiers (Groth and Grandey, 2011). A second way to intervene is by improving sleep quality (Pinheiro et al., 2016). Adequate working conditions and leisure time are most important to enable recovery (Geurts and Sonnentag, 2006). Prioritizing sleep for healthy work schedules should be on the agenda for health promotion initiatives (Takahashi 2012). The person-oriented approach to sleep in workers and employees so far includes sleep extension on weekends, especially for those who sleep less than six hours after work days (Kubo et al., 2011), and online sleep training intervention (including mindfulness training) to increase sleep quality after work (Ebert et al., 2015; Thiart et al., 2015). Cashiers with sleep problems could also be trained in using cognitive-behavioural stress-management to improve sleep quality (e.g., Querstret et al., 2016; Richardson and Rothstein, 2008). The current study is limited with respect to what it can tell us about the processes behind the link between emotional dissonance, sleep, and musculoskeletal pain. Results of cross-sectional studies do allow for many alternative explanations of the observed effects, as reverse causation cannot be precluded (Zapf, Dormann and Frese, 1996). Previous diary research, including actigraphy, however, suggests that work-stress-related activation, sustained after work by perseverative thoughts (worrying) and a lack of detachment from work, is likely to cause the decrease in sleep quality (Pereira and Elfering, 2014b). Cashiers in the study group are representative of a large portion of cashiers in Switzerland who work for a very large retailer group. Nevertheless, differences in musculoskeletal pain between German-, French-, and Italian-speaking parts of Switzerland can not be excluded. Our results needs to be replicated using a larger sample and a longitudinal design. Moreover, future research should account for a possible downward spiral in terms of an ongoing cycle starting with either emotional dissonance, sleep problems or pain. A replication should also rely on assessment of additional task-related and social stressors and resources. The reliance on self-reports might inflate correlations, as response biases (such as acquiescence) influence the assessment of emotional dissonance, sleep problems, and musculoskeletal pain (Semmer, Grebner and Elfering, 2004). The use of sleep actigraphy, for instance, would help to prevent common-method variance (Pereira et al., 2016). Sleep quality is a complex phenomena that comprise several components. By using a single item, sleep quality measurement contains the risk of under- or overestimation, although assessing a global evaluation of a person’s sleep quality might be useful (De Beer, Pienaar and Rothmann, 2014). Rosenzveig et al. (2014) reviewed a similar single item measure of sleep to be appropriate (see also Cappelleri et al, 2009). In addition, emotional dissonance was assessed by single item measure too. The item chosen has good quality and therefore was also included in the “Instrument for Stress-oriented Task Analysis” (ISTA; cf. Kälin et al., 2000). Finally, cashiers from three larger supermarkets were invited to participate, and the response rate seems to be appropriate (Baruch and Holtom, 2008). However, participants who volunteer in this study might not suffer from severe pain or impaired well-being. Especially, a person who developed impaired well-being might quit or might be assigned to less stressful activities, underestimating the impact of work stress (healthy worker effect; Garst, Frese and Molenaar, 2000; Zapf, Dormann and Frese, 1996). In the longer run, such vicious cycles including emotional work demands might result in depression (Vammen et al., 2016). Task demands but also emotion work challenge health in cashiers. High prevalence of neck and back pain in cashiers might result from frequent negative customer interactions. Rigid emotional display rules in cashiers should be revised (or replaced) in a way that enables more authentic but polite cashier behaviour while facing unkind customers (Grandey, Rupp and Brice, 2015). The link between emotional dissonance, sleep problems and neck and back pain was supported by empirical data. Emotional dissonance might be a unique risk factor of neck and back pain with sleep problems as a possible underlying mechanism. Yet, results need to be replicated using a larger sample and a longitudinal design before we can draw conclusions about mediation. The research reported in this article was supported by the valuable help of Pascale Widmer in sample recruitment and data collection. Åkerstedt, T., Nilsson, P. M. and Kecklund, G. (2009). Sleep and recovery In: Sonnentag, S., Perrewé, P. L. and Ganster, D. C. eds. Current perspectives on job-stress recovery: Research in occupational stress and well-being. Bingley, UK: Emerald Group Publishing Limited, 7pp. 205–247. Albu, V. (2016). Measuring customer behavior with deep convolutional neural networks. Brain-Broad Research in Artificial Intelligence and Neuroscience 7(1): 74–79. Hägg, G. M. (1991). Static work load and occupational myalgia: A new explanation model In: Anderson, P., Hobart, D. and Danoff, J. eds. Electromyographical kinesiology. Amsterdam: Elsevier Science Publishers, pp. 141–144. Hayes, A. F. (2013). Introduction to mediation, moderation, and conditional process analysis In: New York: The Guilford Press. Lentz, M. J., Landis, C. A., Rothermel, J. and Shaver, J. L. (1999). Effects of selective slow wave sleep disruption on musculoskeletal pain and fatigue in middle aged women. The Journal of Rheumatology 26(7): 1586–1592. Lundberg, U., Melin, B. and Linton, S. (2002). Stress in the development of musculoskeletal pain In: Avenues for the prevention of chronic musculoskeletal pain and disability. Amsterdam: Elsevier Science, pp. 165–179. Melin, B. and Lundberg, U. (1997). A biopsychosocial approach to workstress and musculoskeletal disorders. Journal of Psychophysiology 11(3): 238–247. Schweizerischer Nationalfonds SNF (2009). Muskuloskelettale Gesundheit – Chronische Schmerzen. Bern: Schweizerischer Nationalfonds SNF. Synthesebericht der Leitungsgruppe [Musculoskeletal health – chronic pain – Report of the SNF steering committee]. Retrieved from http://www.nfp53.ch/files/download/NFP53_Synthesebericht_1004_d.pdf. Semmer, N. K., Grebner, S. and Elfering, A. (2004). Beyond self-report: Using observational, physiological, and event-based measures in research on occupational stress In: Perrewé, P. L. and Ganster, D. C. eds. Research in Occupational Stress and Well-being. Amsterdam: JAI, 3pp. 205–263, DOI: https://doi.org/10.1016/S1479-3555(03)03006-3 Emotional and physiological processes and positive intervention strategies..